Oh I'm sure it is just an excuse. He can't exactly claim that a Priest fresh out the seminary has his own background and experience. That's why I said 'supposedly'. I'm pretty sure Sam Beckett was never a girl scout! Prolly not *L*. At least not pre Leap. That's actually the scene I had in mind. I wanted to know for a roleplay I'm hosting on another message board. Sam and Al would be recruited into a sort of "League of Extraordinary Gentlemen" led by Quinn Mallory (of Sliders fame). I would agree with Nytrydr on this point, Janna. Sam knowingly and intentionally gives up his chance to come home for Al, not once but twice (Leap Home, Mirror Image). I think that fits into the "greater love hath no man than this, that he lay down his life for a friend" category. The point about Sam always remembering Al is a good one. Compare that with the ongoing joke that Al couldn't keep four of his ex-wives straight - but he never stumbled over Beth's name. Sam is the type of guy who would give you the shirt off his back and that is why I think there may even be some Sam in Archer. They both would lay their lives down for a friend. I agree, Sam and Archer are a great deal alike. Someone, somewhere came up with a fan fic where Archer was a reincarnated Sam Beckett. I don't know if it's still around so I'll have to see if I can dig it up. When I saw QL the first time I was 16 years old and fell in love with Sam at once. It sounds a little bit crazy but Sam is a part of my life. It felt like he was really there, he was always around me. I loved his character so much. And he’s a very smart guy I think. He really touched my heart. I love his good heart and his romantic character , the way he is treading people, even the women. I love his intelligence. I like it that he is softly and strong equally. I haven’t seen QL many years after that. In last December I discovered it again and the feeling that Sam is a part of my past, of my life came back. He’s still fascinating me. I think if this person would be real my husband would have a big problem. Last edited by Imagine; 04-28-2009 at 06:02 AM. I know this is gonna sound crazy - a guy saying this! He is a deeply caring and warm person. I know that this post is two years old, but I could not resist to say that I totally agree with this statement. Sam is my example of how a man should be. I suppose that would be a problem for husbands all over the world. Honestly, I've never seen a computer wizard or physics guru looking like Sam, if you know what I mean. I meant to ask you guys a question about Sam: what do you think are his flaws? Sam Beckett is a character endowed with many qualities. One could even argue that his complement of positive traits is a little too unrealistically rich. I like that about him. With so many real people being jerks, it's refreshing to watch somebody that is exactly the opposite, even if he's a fictional character. Still, there must be some flaws as well in Sam and I was wondering what you think they are. Several participants to this thread have mentioned the fact that sometimes he seems "too good", which is something I could also cite as, maybe, a flaw. However, having watched QL straight through only once and being too awestruck by Scott's hotness and geniality in his portrayal of Sam to notice any actual flaws, I can't really answer this question myself. So, this goes out to more experienced leapers out here. What are your thoughts? Sam did get a woman pregnant in the trilogy series with Abigail Fuller! A woman who was a girl in his previous leap where he was her father. I think that I figured out how Sam was actually leaping himself through time as Al the bartender was trying to get Sam to admit to himself. We all thought that this man was God, Fate, Time, or Whatever and he knew what was in his mind more than Sam himself did. Basically, it was Al talking realistically rather than physically when he said that Sam did leap himself and had control of all the places he has been cause he did nothing that he did not intend to do when creating his project. Or was it? Think about it for a minuet! We all have seen that the events leading up to his first stepping up onto the accelerator were not there in the first episode. It started with Al driving down the highway picking up a stranded good looking female motorist. After driving her for a bit, a call comes in from Gooshie on the radio that Sam started to leap already even thought the machine was not ready. 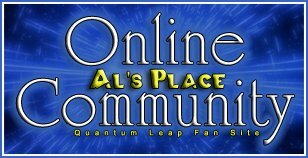 Then in the Leap Back it was revealed that some of the programing of Ziggy was not made aware to anyone else during the original interaction of Sam, Al and the QL staff before the Leap. Remember, Sam had Al mail some codes to help override the Safety lock on the Imaging Chamber door. So obviously there was a lot about the project that Sam never confided in anyone about. What if Sam built a second computer besides Ziggy that was actually controlling Sam's Leaps? That may be why Sam never returned home in the final season. He had to undo all the parradoxes he created when leaping. He saved his brothers life when it was his brother's death that was the driving force that led him to create QL in the first place. If he saved his brother from dying, than he could of never been there in the first place to save him? Just like one of us going back in time to the day we were conceived and trying to stop our parents from procreating ourselves. If we succeeded we would prevent ourselves from being there not to do it in the first place. I think that Sam, after leaving Beth, went to the future and helped an alien race (whom I think Al the bartender of Cokeburn, PA was representing) build a time machine of the extra terrestial race that ended up being the "other machine" that ended up creating Sam's journey through time. Think about it! There is no chronology to the places that Sam has visited in his leaps as he was all over the time of his life. So when Sam asked the bartender "You mean I can go home whenever I want?" with Al replying "Technically yes" and not "Yes" in the sense of absolutely, it was making reference to Sam's overall life and not at the moment of him trapped in time. Thus, he was saying that what ever Sam was going to create later carried out his destiny and would enable him to make that possible, but did not as we have seen. So basically, Sam somewhere in time has another computer unaware to Ziggy, Al, Gooshie and all the QL staff of his time that caused what we have seen take place. Heck, he could of leaped in to Stallion's Gate, NM way in the future to reprogram Ziggy to control his leaps as well, or simply created the second machine before his leaping around. Sam did not return home in the end, cause he could not! Not because he wanted to as some things in history (or in time) needed fulfilling as once he done that he really was aware of his control of his overall destiny. Actually, your theory stands. The only time Beckett is misspelled in MI is in the syndicut. In the original airing, it was spelled correctly with two T's. I know this post is from 2005, but I was surprised nobody else mentioned this: I have only seen Mirror Image all the way through once and that was when it originally aired on NBC in 1993. I don't know what they showed in syndication or what they show on the DVDs, but I remember, along with my horror of reading that Sam never went home, that it ticked me off to no end that they misspelled his name! I even wrote a reaction piece in response to the episode after watching it and that was one of my complaints. I had always imagined it was some unknowing intern who wrote the epilogue cards after the show was complete when they learned that they were cancelled, and they just tagged those haphazardly onto the end. But "Dr. Sam Becket" (sic) was most definitely the spelling of his name in the original airing. Have you seen Scott Bakula's White Streak? Sam's a whiner. There are some Leaps where he's really not feeling it and complains the whole time, even when things are not that bad. How many times has he asked Al to just tell him what he was there to do so he could just do it and Leap out? Even Al tells him in A Single Drop of Rain, "Don't WHINE, Sam." And Sam responds with, "I'm not whining!" Al knows what his friend is like. You might also say he's a workaholic, in school and his job. He never went home when his family lost the farm or when his dad died. You'd think he could have found a way to get away from school. I think he uses his work and his studies to hide from the rest of the world as well, whether intentionally or not. He's stubborn. When he gets an idea in his head, he doesn't care what Al or Ziggy says, he's going to do what he wants. For example, The Leap Home, among many other episodes. Sam's mother even tells Sam that he's stubborn like his father. He doesn't have too many flaws, but those are a few I can think of that I've explored in my own writing. These are all good points and I agree. I would also add that he can be self-righteous. To be fair it's not all the time or even most of the time. But he is like that once in a while in leap, such as in 'Pool Hall Blues', and he is certainly like that with Al sometimes. There are a few episodes where he really belittles Al, especially in Seasons 4 and 5. And he has a double standard when it comes to the rules. Also he's a jerk to Donna in 'Star-Crossed' in my opinion. For the most part Sam is a really good man though. I love the character and I like that he has flaws, even if a couple of his flaws annoy me. It makes him more compelling and more human, not Mary Sue-ish, which can easily happen with a character like Sam who is good at so many things, looks the way he does, etc. Ok,I haven't seen all the episodes yet but I'm certainly spoiled with the ending.I think the reason why he never returns home might be because of his being good at heart.He is always trying to find a way to make everyone happy and save the day. That was another thing I thought about after I sent my post. Sam can be hotheaded at times. As you stated, Sam belittling Al is true. There are times when Sam will raise his voice or get angry at Al, but I can't really think of a time when Al has gotten angry at Sam. Al will get excited and wave his arms around, but he doesn't really get angry at him. But I love Sam dearly and think he's amazing. It's only after you really study him long enough that you start to see that he's not perfect and he's not always right, but you love him anyway. Like you said, it makes him more human. Just out of curiosity, you said you thought he was a jerk to Donna in Star-Crossed. Did you mean The Leap Home? Cause in my opinion, I thought he might have even been too nice to Donna in Star-Crossed. If I was stood up at the altar, I would probably feel more like Al did in that episode. Sam is very quick to forgive and even thinks he knows why Donna did what she did. Although it makes me wonder if that was just his speculation or if Donna had actually given that reason to him after she stood him up. And while we're on the subject, I actually love Al's reaction to Donna in Star-Crossed. You can see his allegiance to Sam as Al is not at all happy to see her. He looks at her with distrust. Sam may not remember all of the details, but Al would have been all too familiar with what she did to his best friend. Sam was probably a wreck after being left at the altar and it would have been Al who picked Sam up by his bootstraps and helped him get over her. Just as Sam helped Al get over his drinking. That must have been a very tough time in both of their lives. In the 'Leap Back' he does seem to brush her off, but I think that was a problem with the execution of the episode not because Sam is really brushing her off. There's actually a discussion about this in the episode's thread, that the episode really needed to be a two-parter because it just feels rushed. But I did mean 'Star-Crossed'. I understand that Sam loves Donna and wants a second chance. But he also feels entitled to her and in my opinion he doesn't respect her boundaries or her. When she says, clearly upset, "Please don't ever talk to me again, Dr. Bryant" that should have been it -- he shouldn't be bothering her again. We, the audience, of course know it's Sam and that Sam is a good guy who doesn't have bad intentions or anything. But I look at it from Donna's perspective. She's a young woman and here's this teacher who has a terrible reputation for hitting on his students and fraternizing with them, who is now -- as it would seem to her -- setting his attentions on her. She's not interested and she politely tells hims so. He keeps pushing and she finally tells him in not so many words that she doesn't want to talk to him again and she wants him to leave her alone. Then the next day he's suddenly there, looking for her in the science building. From her perspective, this gross, lecherous English professor is kind of stalking her -- why is he in the science building? Personally I dislike the episode and this particular story arc. I think Donna comes around way too easily as well, and it's unrealistic that one reunion with her father would heal the hurt that has built up over ten years of having been/felt abandoned. I know it's a television show but that bothers me. Also, maybe her life was better when she wasn't married to Sam. Maybe she wasn't waiting forever for an absentee husband to return. Maybe she had a better job. We don't know, Sam doesn't know and if he does he doesn't remember because of his Swiss-cheese memory. But he never asks that question. I know I'm probably in the minority on this but that's my automatic reaction to this episode. Al is fabulous in this episode. He is the reason why I rated it a 'Fair' instead of a 'Poor' [and also because the kiss with history is done well in this one]. Yes to everything you've said here. Al has already seen Sam go through that -- and he's been hurt in very similar ways himself of course -- so he definitely relates and doesn't want to see Sam put himself through that. Again. And yet, he also understands that Sam wants his second chance, just as he would want that second chance. So he gives it to him and tells him Donna's father's name even though he's going against the rules to do it. So you see, I too explore the idea of Donna having a decent life despite what happened between her and Sam and I even throw a little inside joke in along the way. I think that's a really great, very realistic way of dealing with the character and story arc. Is this fic online somewhere? I'd be interested in reading the whole thing. My stories are a series based on an alternate timeline that I began in 1992. I've written and completed several short stories and novellas, but I kinda wrote them out of order as my mood suited me. I'm actually just finishing up the first of the series right now. You're welcome to read any of them (I have them on google docs right now, only), but it might be good to wait until at least story #1 is finished. I'm making myself finish number one right now because so many people have expressed interest in reading the series. Only my "editors" have read *everything* at this point. I wrote a novelette in about 1990 called "Bookends" that is posted on fanfiction.net if anyone is interested. It attempted to fill some of the holes in the first 2 seasons of QL. It was written in a rush of love. I've read over this thread. Can I say a little? I think Sam was a little spoiled. Not so much by his Mom and Dad, but by the people who felt he was a great GREAT gifted young man and probably just fell in love with this amazing mind that was so sell-effacing, kind, warm to a fault. Sure, LoNigro probably supported and spoiled him. Al was a splash of cold, fresh reality in his face. They became a team because they are like minds, both brilliant, both quick thinking. Both think well on their feet and Sam is more sensitive but oh so smart, so fresh, so completely devoted. And he can be stubborn and pouting. He does whine but never to the point (IN MY OPINION) of hurting anyone but himself. There is a great soul there, glowing in his eyes. Yes, Scott gave us a great gift and his name is Sam and he is someone who dips his head in embarrasment when someone compliments him, cheeks burning red and just a little smile. I guess I'm just saying what I feel and I love him. Brilliant observations and to your comment, "he is someone who dips his head in embarrasment when someone compliments him, cheeks burning red and just a little smile." Can I just say, YES! That is Sam to a 't" and something I've referred to more than once in my own writing. Perhaps I should give your fanfiction a look. Yeah, from what little glimpses we got of his family his Mom and Dad were very good about not spoiling him. And while they recognized his genius it seems they made sure he had a somewhat regular upbringing with school and sports and chores, etc. A kid with Sam's genius could have easily been pushed by other types of parents into starting college much earlier even than he did and ended up being very isolated, but the Becketts didn't do that. Last edited by blue enigma; 09-28-2013 at 12:38 AM. A shame, as I'd have loved to use the idea in a story of Al streaking while at the orphanage, and the nuns being scandalised! And if Al streaked he was probably trying to get out of having a BATH! I am enjoying this thread as it gets my head moving. I wrote a series of novels (fanfic), all post Leap, where Tom ends up a suicide after Sam comes home. I had an uncle who killed himself after WW2 and I wanted to write some of what my grandmother had told me. He had a very ideal life, his parents and a lovely country home, sisters who adored him, but he just didn't want to live. He'd seen friends die next to him, his mind was shattered. I also think Sam may have some form of PTS when he does come home, and unlike the end "Mirror Image" gave him, I firmly believe I personally could NOT live without him coming home. My theory on this was that Al helped Sam with those answers and was either having fun messing with his boy scout buddy's Swiss cheese memory, or basing it on his own (ie Al's) personal experience. Probably the former though, on reflection, as Al would have been a bit old to have got caught up in the streaking craze. The theory that Al helped Sam with the questionnaire is an interesting one and very plausible (and I especially love the discussion here about Al streaking and scandalizing the priests and nuns - it totally fits lol). The idea that he messed with Sam and fed him answers that seem to be dissonant with what we know about Sam's personality especially makes sense. Sam seemed far too serious (and way too busy earning an impossible number of degrees) to get caught up in the streaking craze. On the other hand, Sam was a little younger than everyone in his freshman class when he entered college, which may have made him a bit of a target. His streaking/expulsion may have been the result of a practical joke or a set-up by peers who were older than him and socially more ahead of him. Another possibility is that Sam answered the questionnaire (with or without Al's help) as Tom Stratton would have. Al has already informed him at this point that he needs to convince everyone around him that he is Tom Stratton (same goes for any leapee). Streaking and being expelled for it isn't Sam's style, but we know that Tom Stratton is a practical joker, a daredevil, etc. so it very well might've been his style. Maybe Al even got some of this information directly from Tom in the waiting room and passed it on to Sam for the questionnaire.